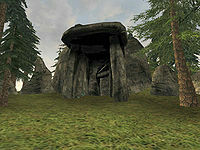 Kelsedolk Barrow is the tomb of a deceased Nord located on the western coast, a short distance south from Raven Rock. This tiny barrow has only one container - a tomb containing one Raw Stalhrim, although there are the permanent corpses of two dead adventurers. There can be up to five inhabitants: anything from a single Bonewolf at level one through to Draugr and Greater Skeleton Champions from level 10, the former becoming more common after level 20. This page was last modified on 19 April 2013, at 05:56.